Using a laser level to mark a ceiling, is clearly a project that cried out for some heavy preparations! . This is time-consuming, slightly monotonous work that can involve a lot of measuring and marking. If writing upside down and wobbling on a ladder for most of a day doesn’t sound appealing to you, you’re going to want to do your leveling and some of your marking with a laser level. Let’s specifically look at a particular type of level, the cross-beam. Now, we’ve learned that there are basic laser levels such as point creators and line lasers, as well as the truly advanced rotary [laser level]. But the sweet spot for a ceiling job is the cross-beam laser level. This gem creates intersecting vertical and horizontal lines. You can use it to create little boxes to make yourself feel as if you’re in a futuristic film where the hologram villain is about to appear. Yet, that’s a bit off topic when it’s time to put in your ceiling. This is why you need to use a laser level to mark a ceiling. To put it simply a cross-beam laser level basically turns two laser shoots into one. 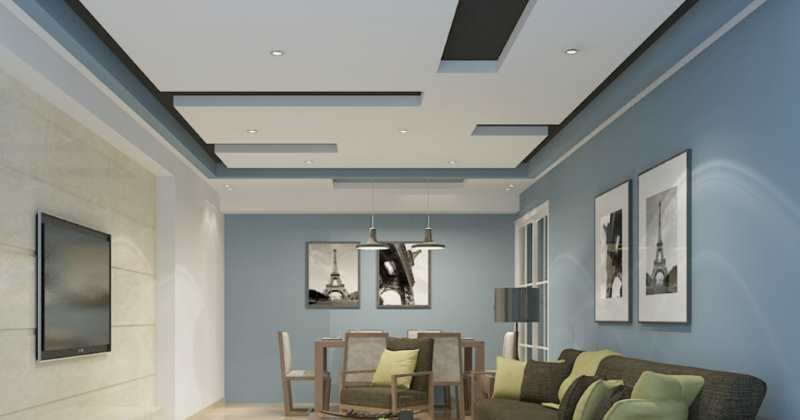 As we go through the process, we’ll assume you are putting in recessed lighting, since that’s one of the most common applications that people would mark a ceiling for. First up is planning out your grid of lighting. In addition to getting the dimensions of the light fixtures you also need to plan out the positioning of the fixtures. Obviously, getting the dimensions of the ceiling itself is key, then doing some easy math to space the fixtures as you desire. You can draw a little plan on paper, but the most important thing is to write down the distance from one wall to the first light fixture and so on. Now that you’re ready to install the first fixture from one of the walls, break out the cross-beam laser level. Place it equidistant between the two walls. If you’re using a self-leveling laser, give it roughly a minute to self-level. If not, take it through the quick self-leveling phase. Shoot the cross beam so that you get both vertical and horizontal beams. This is when you make your actual markings for the placing of the light fixtures. Use a laser measure to find the distance from the wall where the first fixture will go. You will mark it along the line that runs horizontal to the wall. You now use the vertical beam, intersecting it with the horizontal beam. Keep moving the vertical beam along to meet the measurements where you’ll want each light to go. Simply make the mark tight on the horizontal beam. Now you know how to use a laser level to mark a ceiling!!! You now have a nicely-marked wall, and we’re afraid the guide to actually putting in the lights will come from the lighting folks. As you can see, when you’re doing items in a series across a wall or ceiling, having laser lines that go in both directions is quite important and quite beneficial. It’s as though the laser level were designed for drawing lines on ceilings. The important thing is just to make sure to take the time to make sure everything is precise.